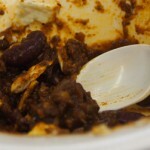 Best Chili in America… and in DC? When I think about Chili, I think of cowboys huddled over fire-licked pots on a sparse Texas desert, or maybe a Southwestern chili cook off, but I never would have thought Washington DC. But we found out it might be home to the best chili in the United States. 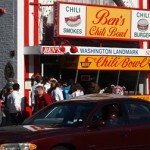 Ben’s Chili on U Street was on a list of free or inexpensive things to do in the city, and you can’t imagine our excitement when we realized that a cup of Ben’s Chili was only $5.45. So we added it to our list, assuming it would be at least “$5.45 good. The price belied the amazing chili that was awaiting us – only after we arrived would we learn the storied history of this amazing dive. Located in the historically black Shaw neighborhood of northwest D.C known as “Black Broadway,” it has been an unflappable part of the neighborhood’s history since its founding in 1958 by Ben Ali. During the riots following the assassination of Martin Luther King in 1968, many of the surrounding buildings were destroyed, but Ben’s requested and were permitted to stay open past curfew. During this time, it was a place of healing as many police and protesters dined here together. It is still regularly visited by celebrities including its most recognized customer Bill Cosby and the restaurant’s founders have been inducted into the D.C. Hall of Fame. In January 2009, then-President-elect Barack Obama ate at Ben’s as part of his welcome to the city, there’s even a plaque wear he sat. When we got there, the place was absolutely jammed with people – no fewer than fifty were lined up along the cramped bar waiting to order, so while Wallace and I made our way to the line, Kimmer and Barb nabbed a booth – boy did they look like tourists sitting there without food. When the food finally arrived (a bit slow, but understandable, did I mention the line? ), we immediately dove in. So quickly in fact that we forgot to take pictures first. The chili is quite unique and worth the wait. The exact ingredients remain a closely-guarded family secret. There’s obviously a hint of the normal peppers and salt, but Ben’s also uses generous portions of water to “smooth out” the beef and that makes their chili more like a paste than most. In addition, the Trinidadian Ben added curry to the mix. This is a DON’T MISS! They even offer vegetarian versions of their chili. For more information, and to check out their menu, click here.